2018 Chevrolet Equinox Trim Levels with Comparisons & Configurations. What 2018 Chevrolet Equinox Trim Level Should you Buy? What is the Difference Between Trims? Chevrolet has almost completely redesigned the Equinox as part of its reshuffle of its SUV line. 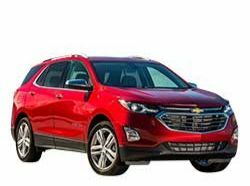 The 2018 Chevrolet Equinox is slightly smaller and significantly lighter, putting it solidly in the same size category as the rest of its compact crossover SUV competition. Similarly, Chevrolet has put a lot of effort into modernizing the Equinox to turn it into the kind of car that today’s drivers are excited to get into. The new Equinox has jumped ahead years in terms of its infotainment and active safety technology, resulting in a very clever and intelligent compact crossover. The new features are distributed among the same trim levels that have been with the Equinox since its mid-cycle refresh in 2016: L, LS, LT and Premier. Choosing the right model is additionally complicated by the several optional packages available on most of the models, as well as the ability to choose between two drive modes and three different engines. In this guide, we take you through all of the different trim levels offered on the 2018 Equinox to give you an understanding of the options and features available on each one. With that information at your disposal, it should be easy to select the Equinox model that gives you the best combination of features and value. Compare the 2018 Equinox L vs LS Trims. What is the difference? The new Equinox offers drivers a very pleasant surprise with its entry-level L model. The Equinox L is filled to the brim with great must-have tech, some of which many of its competitors limit to mid-range or higher-end models. The L includes a standard MyLink infotainment system that has been upgraded significantly from its previous versions. The new menus are easy and intuitive to navigate and the 7-inch touchscreen controls are responsive and smartly positioned. It is linked to a six-speaker audio system, a USB port, and Bluetooth with voice commands. It also supports both Apple CarPlay and Android Auto, allowing you to use your smartphone’s apps through the touchscreen display. Using your favorite internet radio or navigation apps is made even easier by the car’s integrated Wi-Fi hotspot, available through the GM OnStar service. A rearview camera and Teen Driver controls are the standard safety features on the Equinox L and the remote starter is the only major available upgrade. It is important to note that the L is only available with the base 1.5-liter turbo engine producing 170 horsepower and is limited to front-wheel drive. Where the Equinox L is a pleasant surprise, the LS is not so much. Roughly $2,000 more expensive than the L, the LS only adds a couple of fairly prosaic features like rear floor mats and a spare tire to the car. Those are pretty weak selling points for the Equinox LS, with its real value coming from being the first Equinox model with available all-wheel drive, which adds almost another $4,000 to the final MSRP. The LS can also be customized with either the Blackout or Chrome appearance kits. Besides that, the LS has little other features of note that are not available on the Equinox L.
If all-wheel drive is not an important consideration for you, then the Equinox L is unequivocally the best choice of the two trim levels. If all-wheel drive is a must-have, then the Equinox LS will be the least expensive way to get that functionality. That said, if you are set on getting an all-wheel drive Equinox, then you may want to consider moving up to the LT model instead. It is only slightly more expensive, but adds quite a bit more in terms of equipment, giving you slightly more value for the price tag. Compare the 2018 Chevrolet Equinox LS vs LT Trim Levels. What is the difference? The Equinox LT, unlike the LS, is a fairly sizable update to the vehicle. It adds bright high-intensity headlights, a powered driver’s seat, satellite radio, and second row release levers for easy access to the rear cargo area, all for roughly $1,200 over the LS model. More importantly, the LT model is the one that really opens up the Equinox customization options. It is likely that the LT, in its various configurations, will end up being the most sold Equinox trim of all. In addition to having both front-wheel and all-wheel drive configurations available, the LT can also come equipped with any of the Equinox’s three engines. The LT 1.5L has the same engine as the L and LS models, while the LT 1.6L trades it in for a 138-horsepower turbodiesel that gives it an impressive boost in fuel economy. The LT 2.0L is the premium engine option, generating 252 horsepower and coming bundled with shiny 18-inch wheels and chrome exhaust tips. In addition to those options, the Equinox LT also can be equipped with two optional packages. Confidence and Convenience adds blind spot monitors and rear cross traffic alerts, parking assist, heated front seats and side mirrors, dual zone climate control and remote start. The Sun and Infotainment package meanwhile, adds a moonroof, a larger 8-inch touch screen and a full six USB ports, as well as one 120-volt outlet. The sheer amount of versatile options that the LT adds make it one of the most attractive models outside of the base L. Even without choosing any of the optional engines or packages, the LT on its own offer a significant improvement over the relatively sparse LS model. When considering the package options, the Confidence and Convenience package in particular packs a lot of in-demand features into one place, and is easily worth the money if those features are important to you. The 2.0-liter turbo model can definitely be attractive to fans of the older Equinox, as the current model’s base engine is actually slightly weaker than the outgoing entry-level engine, but it is a pricy add-on. The diesel should not be overlooked. Adding 2 miles per gallon in the city and 7 mpg on the highway, it can significantly reduce your fuel consumption, especially if you do a lot of highway driving. Its strong torque also makes it a good choice if you often find yourself towing a trailer as well. Compare the Equinox LT vs Premier Trims. What is the difference? The Premier is the top of the Equinox line, and it lets you know it. Comfort features are the name of the game in this over-$30,000 high-end trim. It has a full leather interior, driver’s seat memory, and all of the features of both the Confidence and Convenience and the Sun and Infotainment packages from the LT, with the exception of the moonroof. That is instead available in one of the two optional packages unique to the Premier - the Sun, Sound and Navigation package, which also includes an upscale Bose audio system, a navigation system built into the 8-inch infotainment touchscreen, and 19-inch premium wheels. The other optional package on the Premier is the Confidence and Convenience II package. This package builds on the active safety features of the LT Confidence and Convenience package, adding a forward collision warning with automatic low-speed emergency braking, lane departure warning and lane keep assist, automatic high beams and a 360-degree camera. It also comes with some nice convenience features like rear seat and steering wheel heating, front seat ventilation and a powered passenger seat. Considering the Equinox Premier includes both of the optional LT packages, the actual upgrade between the two only costs about $60 and a moonroof. Unless the latter is particularly important to you, then the Premier is almost an obvious choice. Both vehicles are available with the same drivetrain and engine selections, so there are no compromises to make there. Confidence and Convenience II is a necessary upgrade if you are looking to maximize safety features, and is definitely worth the cash, but the Sun, Sound and Navigation can feel expensive at a list price of $3,320. While still a solid choice if those features matter to you, it doesn’t have the same degree of value as the rest of the Premier package in our minds. The 2018 Chevrolet Equinox is fairly unusual in how it divides it various features among its four trim levels, but it still manages to make almost all of them an attractive choice. Depending on what you are looking for, all but the strangely-bare LS trim can be an excellent choice and offer you excellent utility for the money. The base L is an impressive value given all of the features it includes as standard, though it is hamstrung by the lack of the all-wheel drive option. Going for a bare-bones all-wheel drive setup is pretty much the only reason to choose the LS, and even then it offers only small savings over upgrading to the much nicer LT. The LT with the Confidence and Convenience package is probably the best value along the Equinox spectrum, as it has pretty much all of the features that buyers traditionally look for outside of leather seating. For that, the Equinox Premier offers an equally attractive value proposition that is only sweetened by the advanced safety tech available in the Confidence and Convenience II package.